With Chelsea and Spurs both picking up wins, it was vital that we maintained the pace in the race for Champions League qualification. The next month or so sees us face both Tottenham and Everton, sandwiched by cup ties with Blackburn and Bayern. We are entering the period that will define our season, and momentum is crucial. I was very surprised to see Lukas Podolski on the bench again, with Aaron Ramsey handed a start. However, Arsenal’s midfield dominated the game, and there was a slightly different shape in evidence too. Ramsey sat in a deeper role alongside Arteta. Jack was playing as the advanced midfielder, with Cazorla ostensibly starting from the left-wing. In truth, Cazorla spent almost the entire game playing inside, combing with Jack and the strikers. It was a less a midfield three and more of a four, replicating the ‘magic square’ that the Brazil national team have been known to use. Jack’s combination play with Santi had been mesmerising. When we lost Wilshere, we also lost our way a little bit. It was noticeable too that Sunderland improved significantly when they replaced the thuggish Cattermole with the more technical Larsson. I appreciate that Carl only knew he was playing 15 minutes before kick-off. I also appreciate that we came across a referee who seemed only too happy to hand out cards to our players while letting their Sunderland equivalents get away with (attempted) murder. Despite that, Carl Jenkinson’s sending off was very silly indeed. Having picked up a booking inside the first ten minutes, he was always walking a tight-rope. When walking a tight-rope of any kind, it is not advisable to make any sudden lunges. Unfortunately, Carl did just that at Stephane Sessegnon, and a second yellow duly followed. By contrast, Bacary Sagna was a rock at centre-back. Like Jenkinson, he didn’t know what role he’d be playing until shortly before kick-off. Unlike Jenkinson, he excelled. I think some of the criticism aimed at Sagna in recent weeks has been extremely harsh. Yes, his recent performances have fallen below his own impeccable standards, but he remains one of our best players. I love Carl, but a few good games earlier this season do not make him an international class defender. Nacho Monreal coped well, Per Mertesacker organised an unfamiliar defence, and Wojciech Szczesny had his best game of the season. Aaron Ramsey also deserves enormous credit for filling in superbly at right-back when required. …ought to have been better. Olivier Giroud and Santi Cazorla both squandered glaring opportunities to seal the game on the counter. Fortunately, we were able to fall back on an outstanding defensive display to get the three points. As I write this it seems the “false three” is on the verge of joining Gremio on loan. It’s remarkable to think that on the final day of last season, he was preferred to Kieran Gibbs and scored a crucial goal in our ascension to the Champions League places. His fall since then has been spectacular. I can’t help but feel that the infamous shirt swap incident with Robin van Persie was a huge catalyst towards his departure. On that day, he lost the fans, and it’s almost impossible to come back from that – just ask Emmanuel Eboue or Nicklas Bendtner. Every mistake is highlighted; every indiscretion scrutinised. I’m not sure that Santos has been more error-prone than many of our other defenders, but the tide turned against him on that November day. I wish him all the best. He seems like a very decent guy, if not a great defender. I also have to question our policy of continually weakening our squad. When Arsene signed Nacho Monreal, he suggested it was because he needed two left-backs at all times. Why has that changed in the space of ten days? The fact we’re playing Sagna at centre-back suggests that loaning Djourou out probably wasn’t the smartest move. I hope we don’t pay for allowing other players to leave at a time when it’s impossible to replace them. It strikes me that there are three topics of discussion today. The positives of last night’s game, the negatives, and the impending transfer deadline. I’ve decided to hit those one at a time. It’s now 5 goals in 3 games for the Frenchman. His second half display included some of his most convincing moments in an Arsenal shirt. His goal was the sort of header that is becoming his trademark, while his lay-off assist for Theo was absolutely gorgeous. Even Theo’s biggest doubters must be coming round now. His volley was a fantastic finish and gave him his 18th goal of the season. To put that in perspective, that’s more goals than Freddie Ljungberg scored in any season of his fondly-remembered seasons with Arsenal. It is a massive contribution. Disastrous. Woeful. Apocalyptic. Really, really bad. Perhaps in years to come we’ll look back upon allowing Jordan Henderson to waltz through our back-line and score as the nadir of our defensive troubles. Jordan Henderson can barely play football, or indeed waltz, and yet we made him look like Lionel Messi. 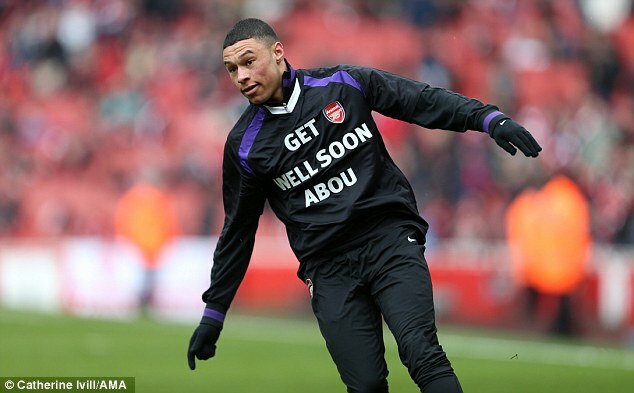 Gibbs is now out for the dreaded “three weeks”. With Arsenal players, three weeks tends to become three months very quickly indeed. Arsene Wenger knew after he saw Will Buckley give him the runaround at Brighton that Santos was a liability. So why bring him on? He could easily have introduced Laurent Koscielny and shifted Thomas Vermaelen to centre-back, giving the defence a far more solid look. Even with the injury to Gibbs, I’m not expecting much activity at Arsenal. It’s increasingly clear we had hoped to make a big push for David Villa, but Barcelona had no interest in selling. If anyone does come in, it’ll be the hurried signing of a defender, most likely on loan. However, I wouldn’t bet on it. I’ve got plenty to say about our potential inactivity, but I’ll hold it for tomorrow. Finally, for anyone who missed it yesterday, you can watch my take on today’s events below. Thanks for all the kind comments about the video; I’m glad you enjoyed it. If you missed the game and saw only the score, you might think that this was a close affair. In fact, as an Arsenal supporter, you’d most probably be quietly relieved at the small disparity between the two teams – it’s a hell of an improvement upon 8-2, for one thing. In reality, however, the gulf looked as wide as it ever has. United missed a penalty and mustered a further seven shots on target. Arsenal managed just three, all of which came during stoppage time at the end of a dead rubber of a second half. He was disappointed. Not just at his own side’s lack of efficiency, but at the sheer lack of competition. Fergie loves a fight, and Arsenal simply didn’t give him one. I don’t know if you’ve ever seen the film Hook, but it is one of Hollywood’s great cinematic masterpieces. It features an astonishing turn from Dustin Hoffman as Captain Hook. He kidnaps the grown-up Peter Pan’s children, and uses them as bait to lure Pan to NeverNeverLand for one great last duel. However, when Pan does show up, Hook realises he is now just a fat, flabby, middle-aged man. He’s no longer the great warrior Hook loved to do battle with. The war is over, and the eternally combative Hook is devastated. That’s how Fergie looked in the post-game press conference: no smug self-satisfaction; just genuinely gutted that we can longer proffer a credible challenge. In the film, encouraged by the Lost Boys and a preposterously named vagrant called ‘Rufio’, Pan rediscovers his former glories, learns to fly, fight and crow once more, and returns for one final titanic clash. At the moment Arsenal look a long way from such a resurrection. And Rufio is dead, so that’s out the window. Last season Arsene Wenger took a lot of flak from supporters. This season it seems to be Gazidis’ turn. I do have a degree of understanding with some fans’ frustration at what they perceive as the poor running of the club. But here’s the thing: an almost identical XI performed far better at the City of Manchester Stadium, in a game which finished 1-1 but in which Arsenal really ought to have won by a goal or two. City and United are about as good as each other. The disparity between those two Arsenal performances is nothing to do with Ivan Gazidis, and the responsibility for the downturn in form must be laid squarely at the door of the manager and the players. There are three reasons. The first is that is contract situation has undoubtedly seen him slip down the pecking order. The second is that he played 120 minutes in midweek. The third is that Arsene was always likely to pick Aaron Ramsey on the right in the hope of replicating the aforementioned City performance. Of those reasons, I genuinely believe that on this occasion the second and third were more influential than the first. In future, however, I hope Arsene doesn’t cut off his nose to spite his face by leaving Theo out at a time when we plainly need him. When Robin van Persie took on the armband, he seemed to grow as a man and a player. Since Thomas Vermaelen inherited it, he has shrivelled like a slug in a Bloody Mary. His mistake for the opening goal was absolutely criminal, and it was an error which compounded several weeks of poor form. Perhaps it’s unfortunate timing that this dip in his performances has coincided with becoming skipper, or perhaps the broadened responsibility has led his own game to suffer. Either way, he needs to improve quickly. At the moment the armband is the one thing keeping him in the team. You don’t have to know him to see that Andre Santos is a nice guy. He’s always got a smile on his face, is clearly popular with the squad, and is basically a cheeky cuddly good sort of bloke. Now, I will grant you this: he’s a bit slow, a bit positionally naive, and probably not good enough to be a long-term option for Arsenal at left-back. He had a very poor game against QPR and quite a poor one against United. 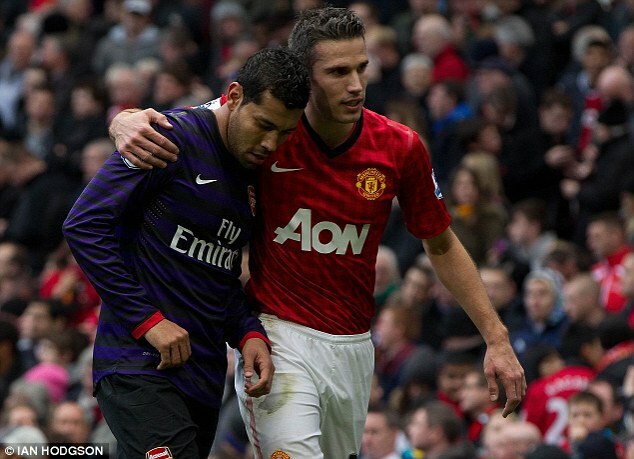 And yes, he swapped shirts with Robin van Persie at half-time. But none of that is enough to justify the abuse this guy is getting from his own ‘fans’ on twitter. You may not know this, but pros swap shirts at half-time all the time. It’s a regular thing. It usually happens in the tunnel, rather than on the pitch, but it’s no biggie. Especially between friends, and that’s what these players are. Just like you might be friends with your former colleagues. You all saw Van Persie hugging Arsene at half-time, just minutes after scoring the goal that separated the teams at that point, and yet Arsene seems to have escaped censure. Santos is the latest in a long-line of scape goats. The likes of Bendtner, Eboue and Arshavin have all been down that path before him, and it doesn’t end well. Personally, I think it stinks, and I hate what I see a section of the fanbase dishing out to a guy who is still our player. Get a grip, people. That’s the truth. I’m not worried about shirt-swapping or referee decisions or anything else: I’m worried about this team. The decline in recent weeks has been alarming. Leaving aside that anomalous League Cup game, the first team have lost three of the last four. On Tuesday night we face an intimidating trip to Schalke, and we’re only a couple of weeks away from a massive North London Derby. As it was, off the back of that dire display against Norwich, I fancied Schalke from the off. The German side have some very good players, and came in to the game off the back of a morale-boosting victory over Dortmund: a side good enough to beat Real Madrid last night. Last night, our first shot on target came in the 93rd minute courtesy of 17-year old substitute Serge Gnabry. By my count, that makes for one shot on target mustered in each of the last two games, neither of which you would even stretch to calling a ‘half-chance’. The defensive frailties are nothing new, but this lack of attacking threat is unfamiliar and alarming. The last time I can remember an Arsenal side looking this impotent was just before the January transfer window in which Arsene pulled his finger out to sign Andrey Arshavin. Andre Santos had a stinker. If you head down to Hackney Marshes on a Sunday morning, you will occasionally catch sight of me taking to the field as a leaded-footed, positionally naive left-back. Alternatively, you could just watch reruns of Andre Santos’ performance last night, as he huffed, puffed, and struggled his way though a truly torrid 90 minutes. I was alarmed to see that he repeated his trick of standing several yards behind the defensive line, allowing Huntelaar to be played onside just as Grant Holt was on Saturday. In the first half, Per Mertesacker kept us in it, but eventually the weaknesses of those around him were exposed. I don’t see the sense in dropping Giroud. I know he hasn’t set the world alight, but I really don’t think there’s any point in persisting with Gervinho as a lone striker. Last nights horror show showed that ‘Goalvinho’ is not a viable long-term option. Why not play Giroud and at least allow himself a chance bed in? Rotating him in and out of the side simply harms his confidence, and right now we haven’t got a better option than the Frenchman. Every so often he will do something fantastic. More often than not, he will run in to blind alleys, away from his team-mates, and give the ball away. Gervinho is a maverick. He is not capable of cohesive team play. His head goes down, and one has the impression that he himself barely knows what he is going to do with the play. Players like him have their place in the game, but it is generally in mid-table. Sides who see little of the game, and require a game-breaker to do the unexpected. Arsenal are an intelligent, possession side. That is not Gervinho’s game. Arsenal desperately need to sign a striker. See previous two points. I’m not sure this requires much expansion. In a world in which Demba Ba is available for just £7m, there is no excuse for Arsene not bringing in a reliable front man in January. The AGM will be a feisty affair. Already last night there were chants of “6%; you’re having a laugh” and “Ivan Gazidis: What do you do?” (albeit with inferior punctuation). One can understand why, especially when you face the unavoidable question: Did we really sell Robin van Persie to play Gervinho up front? I don’t think it’s all bad. There were signs just a few weeks ago that this squad has plenty of ability. Arsenal don’t have the familiar excuse of inexperience to trot out; this is a mature side that should know better. Get back to where we were on Saturday and the picture won’t look quite so ugly.